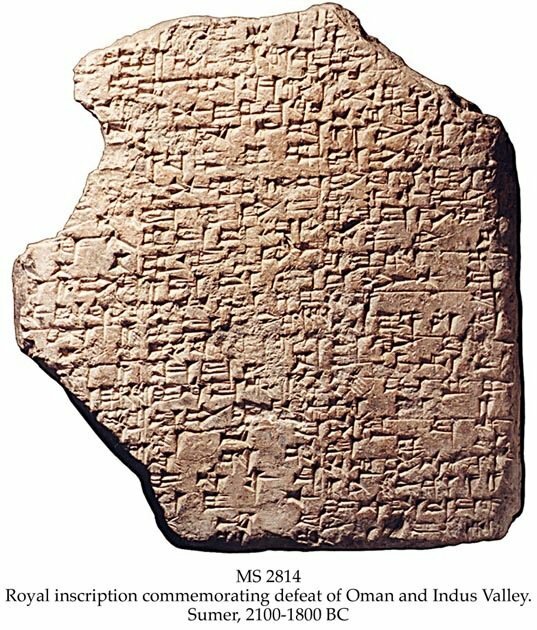 Description	 MS in Neo Sumerian and Old Babylonian on clay, Sumer, 2100-1800 BC, 1 tablet, 14,8x14,0x3,3 cm (originally ca. 16x14x3 cm), 3+3 columns, 103 lines in cuneiform script. The text was copied from a Sargonic royal inscription on a statue in the Ur III or early Old Babylonian period. Magan was at Oman and at the Iranian side of the Gulf. Meluhha or Melukham was the Indus Valley civilisation (ca. 2500-1800 BC). This is one of fairly few references to the Indus civilisation on tablets. The 3 best known references are: 1. Sargon of Akkad (2334-2279 BC) referring to ships from Meluhha, Magan and Dilmun; 2. 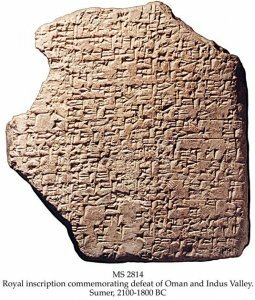 Naram-Sin (2254-2218 BC) referring to rebels to his rule, listing the rebellious kings, including "(..)ibra, man of Melukha"; and 3. Gudea of Lagash (2144-2124 BC) referring to Meluhhans that came from their country and sold gold dust, carnelian, etc. There are further references in literary texts. After ca. 1760 BC Melukha is not mentioned any more. Published	 Andrew George, ed. : Cuneiform Royal Inscriptions and Related Texts in the Schøyen Collection, Cornell University Studies in Assyriology and Sumerology, vol. 17, Manuscripts in the Schøyen Collection, Cuneiform texts VI. CDL Press, Bethesda, MD, 2011, text 22, pp. 29-47, pls. XXI-XXIV. Exhibited	 Tigris 25th anniversary exhibition. The Kon-Tiki Museum, Oslo, 30.1. - 15.9.2003.